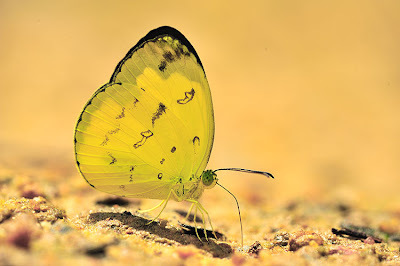 This blog article features the genus Eurema which comprise comparatively small, deep-lemon yellow butterflies with black borders. 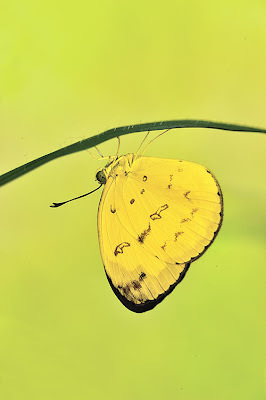 The Eurema, often referred to as the "Grass Yellows" are relatively common in Singapore, although there are actually six distinct species occuring on the island, and one of the species is a recent re-discovery and its habitat is threatened with development. The more common species are found throughout the island, from urban areas to the forested nature reserves. At times, they can be abundant, where hundreds can be seen fluttering in an almost 'migratory' fashion in certain parts of the island. However, these rare 'break-outs' are seasonal, and could have been triggered by a variety of factors - from abundance of host plants, to the absence of predators and parasitic insects which keep the population in check and maintains a balance in nature. 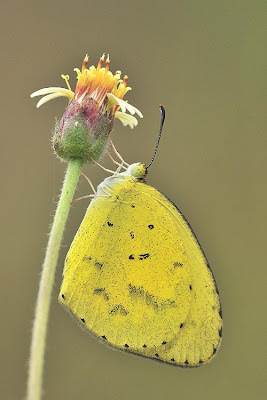 The Grass Yellows are generally weak flyers, fluttering low around bushes and flowers. The caterpillars of the species feed on Leguminosae and it is known that various species have various alternative host plants. Amongst the favourite genera are Cassia (Senna), Caesalpinia, Paraserianthes (Albizia), Acacia and many others. Eurema brigitta senna (No Brand Grass Yellow) - Upperside forewing black apical border serrated but not more deeply excavated in spaces 2 & 3. Male has no brand. 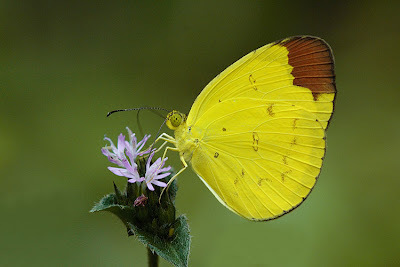 Eurema sari sodalis (Chocolate Grass Yellow) - Underside forewing apical area entirely dark brown. Eurema andersonii andersonii (Anderson's Grass Yellow) - Underside forewing apical area not entirely darkened. Inner edge of black border in space 1a and 1b inclined slightly towards tornus. Upperside black distal border not more deeply excavated in space 2 than in space 3. Eurema hecabe contubernalis (Common Grass Yellow) - Upperside forewing black border in space 1a and 1b at right angles to dorsum or sloping towards base. Eurema simulatrix tecmessa - Underside forewing has a large cleft reddish brown apical spot. 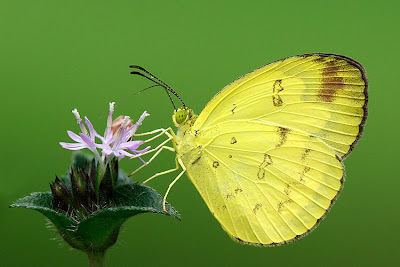 Eurema blanda snelleni (Three Spot Grass Yellow) - Upperside of the male with reduced and narrower black borders. 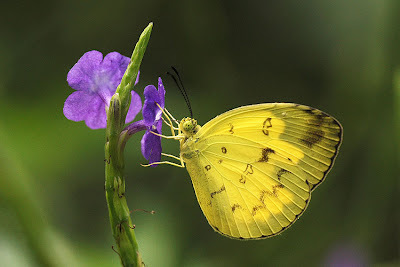 In Part 1 of this article, we feature three of the six Eurema species extant in Singapore. This species is a recent re-discovery, after missing from the Singapore checklist for a number of years. In an earlier blog article, we featured this species in detail. 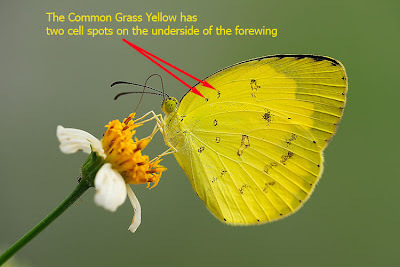 The No Brand Grass Yellow is the only species where the underside forewings are without cell spots. Upperside forewing black apical border serrated, but not more deeply excavated in spaces 2 and 3. 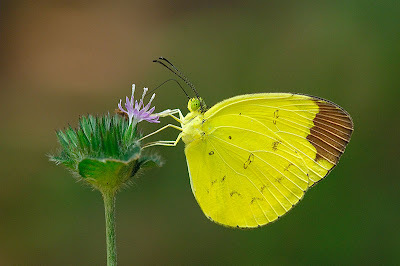 Females are slightly more unique in that the yellow colour of the hindwings are lighter than the forewings on the undersides. The males' undersides are unicolourous as with the other species of this genus. The host plant of the species, Cassia mimosoides has been cultivated and located to other parts of the island in the hope of allowing the species to be translocated from its current habitat, which is under the threat of development. The species is highly vulnerable, although it can be common where its host plant occurs, and its preferred habitat of open sunny wasteland. 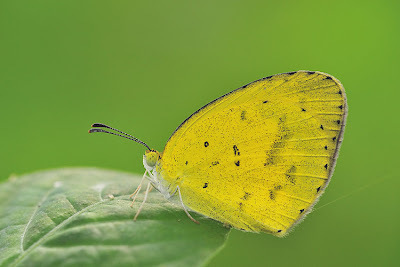 The Chocolate Grass Yellow is amongst the easiest of the genus to identify, especially when the butterfly stops to feed or puddle. 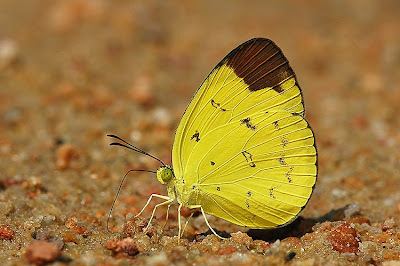 The species' distinct solid brown apex on the forewing beneath sets it apart from the other species amongst the Eurema. The species is locally common, in locations where its preferred host plant is available. However, it is not as widespread as the more common species of the genus, preferring the sanctuary of the fringes of the nature reserves in forested areas. It is more often encountered in well-vegetated areas of the forested parts of Singapore than flying in urban parks and gardens. Where it occurs, males of the Chocolate Grass Yellows are often observed to puddle at sandy banks which have been tainted with fermenting organic matter, carrion and the like. Once it settles down to puddle, it remains quite still as it feeds, and allows an observer to get quite close to it. This is a species that almost exclusively remains in the forested areas of Singapore's nature reserves. It is probably one of the rarer species of the genus (though one can argue that none of the species can be considered 'rare'). 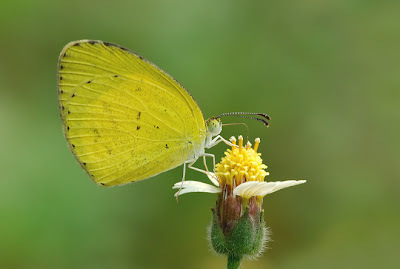 Usually seen singly, the Anderson's Grass Yellow features only one cell spot on the forewing beneath, like the Chocolate Grass Yellow. However, it does not have the former's solid brown apical patch. Like its close cousin, the species has also often been observed to puddle at forest paths and sand banks of streams. In the morning hours, it also visits various flowering bushes as it feeds. Favourites are the white flowers of the Common Asystasia (Asystasia gangetica), the purple flowers of the Common Snakeweed (Stachytarpheta indicus) and several other wildflowers found in the forests. The wings of the species also appear to be more rounded than its close cousins, and it has a comparatively more robust flight. At times it tends to have a habit of fluttering around low bushes, and then settling on the undersides of leaves.